The domain of Valençay has a rather long history starting in 1803 when Charles-Maurice de Talleyrand-Périgord acquired it. 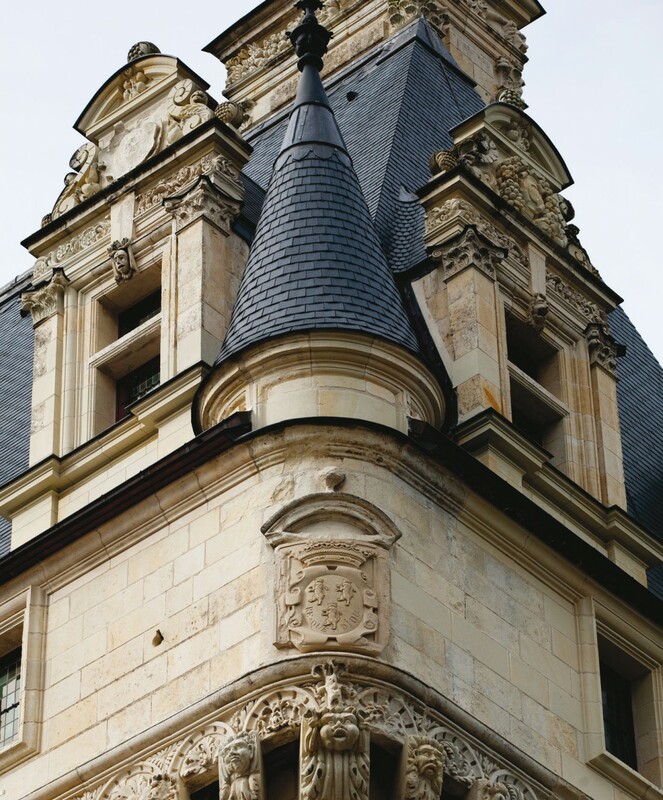 The château was built over three centuries and combines several styles of architecture without disrupting the overall harmony of the structure. 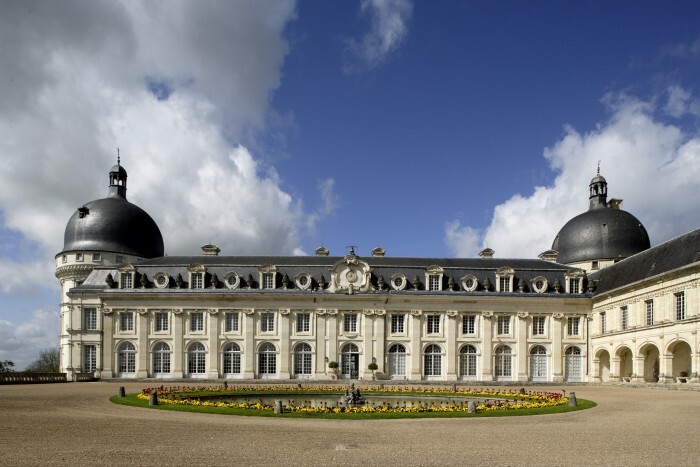 On the contrary, it is one of the most prestigious buildings in the Loire Valley. Divided into three sections (or bays) by thick arches, the point barrel vault of the salle basse (lower hall) covers an area of 49.5 square meters. Documents attest to the presence of the seigneurie (or domain) of Valençay from the 13th century, but all that remains from this time is the salle basse (lower medieval hall), located below the current cour d’Honneur (main courtyard). Property of Eudes de Bourgogne at the time and then passed on to his descendants, the fiefdom was acquired in 1451 by Robert II d’Estampes who extended the property. Ennobled natives of Berry, the powerful d’Estampes family had a very good reputation, integrated themselves into the French aristocracy and held important positions in the hierarchy of the royal court up until the 18th century. 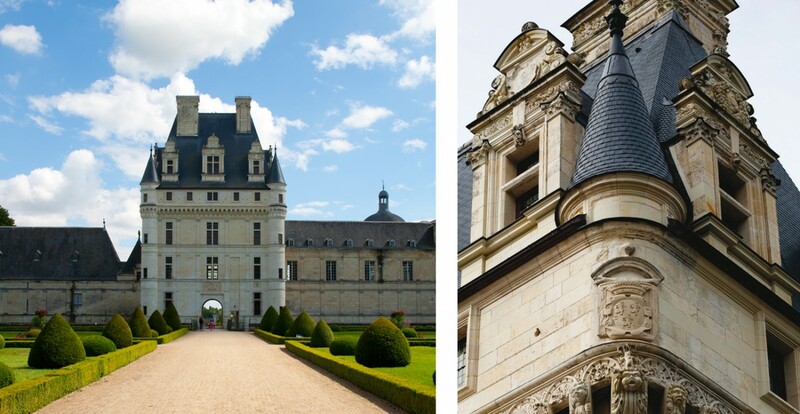 Symbol of this prestigious rise to power, the château we know today replaced a feudal manor. It was built in stages thanks to carefully chosen matrimonial alliances. Its architecture reflects the evolution which gradually replaced the fortified castles of the Middle Ages with the Renaissance style. These architectural changes are linked to the Great Italian Wars, which ran from 1494 to 1559. The sovereigns, François I in particular, and the lords who fought by their sides took this opportunity to marvel at the Italian Renaissance. Implemented a century early in Florence, and then in several other Italian cities, this era was inspired by the revival of the literature, philosophy, science and techniques of ancient Rome and Greece. It spread throughout all of Europe. In terms of construction, the treaty written by Vitruvius, an architect of the first century BC, was used as reference. It highlights the principles symmetry, proportion, regularity and balance. The northwest tower. The medieval machicolations of the upper part were later embellished with scallop shells. “Modern” motifs, also present at Chambord and Blois. Louis d’Estampes, grandson of Robert II, made a rich match in marrying Marie Hurault, daughter of the French Minister of Finances of Louis XII, which triggered the construction around 1520. First by building the large northwest tower, then half of the west facade and two bays of the north gallery. The south gallery, near the cour d’Honneur, was built in the next decade. 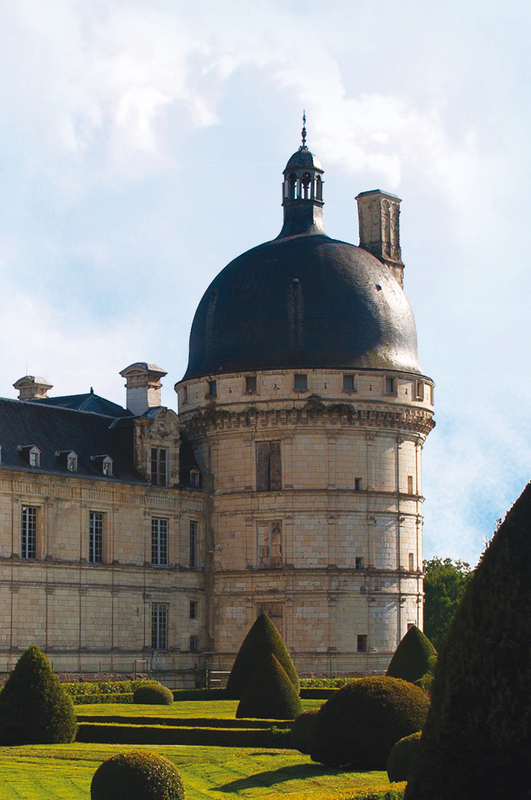 In 1540, Jacques, son of Louis and Marie d’Estampes, who also married into wealth, began to finish building the large tower, adding an imperial roof which was not yet very common. The marriage between his son Jean and Sara d’Applaincourt, heiress of the fiefdom of Picardie, relaunched construction with the building of a remarkable keep. This square tower flanked by cylindrical turrets on both sides of the entrance and the courtyard had a porte-cochère and a pedestrian door. The construction of a wing symmetrical to the main buildings, between the round tower and the keep was initiated but remained unfinished. Leading to the main courtyard through basket-handle arches, it marks the evolution of the architecture towards the Renaissance style. The facade of the south gallery. The capitals (topmost part of a column or pilaster) were unquestionably inspired by ancient Roman architecture: Doric order on the ground floor, ionic order on the first floor and canonical order. The keep. 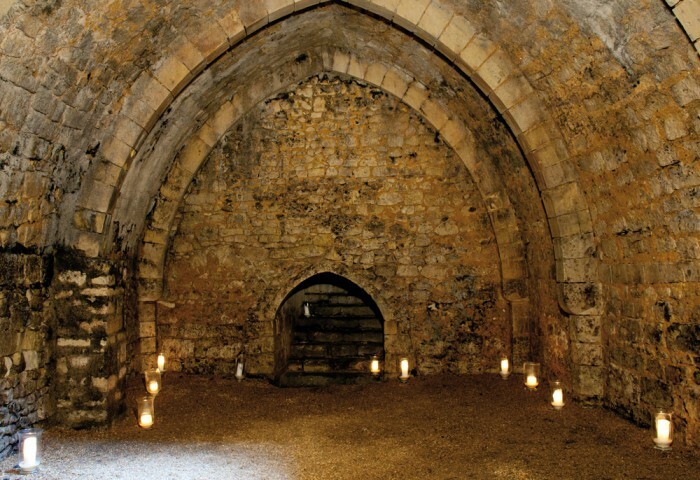 Although a perfect example of medieval architecture, the keep was not built for defensive purposes. Its monumental grandeur and beauty glorified the power and importance of the owners. Rich sculpted decorations. Each corbel (an architectural member that projects from within a wall and supports a weight) has a different mask extended by a special kind of foliage. The coats of arms of the cousins of the chatelaine, Sara d’Applaincourt, highlights of the alliances of the d’Estampes family. 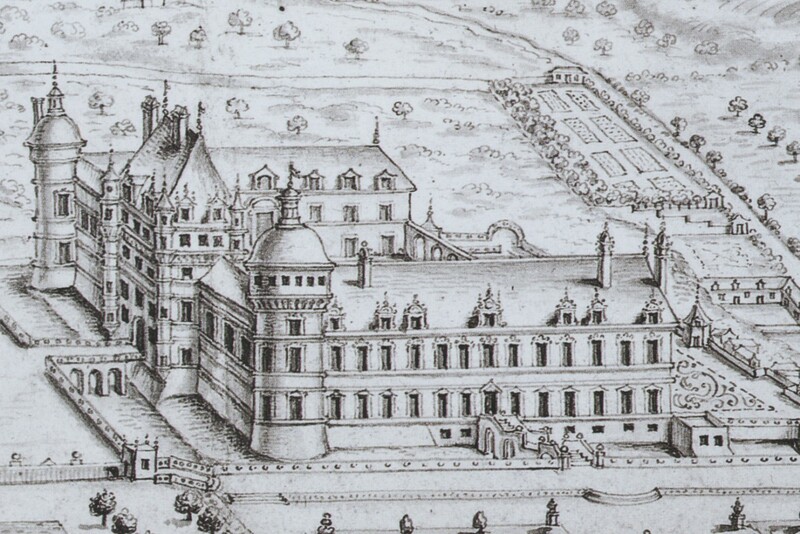 View of the château by Roger de Gaignières, 1705. Paris, French National Library, d’Estampes section. It was under the reign of Louis XIV, when the title of second Marquis de Valencay was given to Jacques II, and then to his son, Dominique, that the d’Estampes family reached its peak. Dominique made a prestigious alliance in marrying Marie-Louise de Montmorency and had a particularly favorable position in the king’s court. 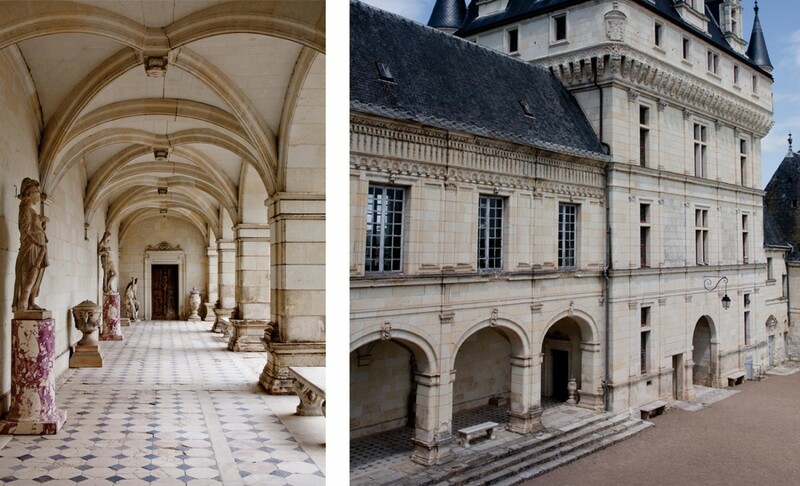 Thanks to him, the buildings surrounding the cour d’Honneur were completed: end of construction of the west wing, coupled with a gallery, construction of a symmetrical wing to the east, a stone arcade wall to the south closing the courtyard. The west wing. The facade, rebuilt in the classical age, has fluted pilasters running all the way up to the top, ionic capitals and a mansard roof. Following premature deaths in the d’Estampes family and conflicts related to heritage and the estate, the château was sold several times before becoming the property of farmer-general Philippe-Charles de Villemorien in 1766. He also bought the domains of Veuil and Lucay-le-Mâle. The embellishment of the château and the estate cost him two million French livres. While the wing was destroyed to clear the view as well as the arcade wall, a tower similar to that of the northwest was built south of the main building. In terms of the main building, a new facade was built facing the courtyard and the roof was replaced.